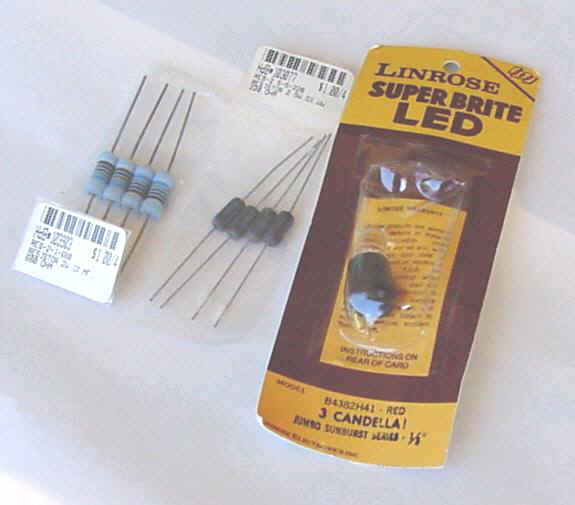 Light Emiting Diodes for an artificial star. The light bulb is specified to operate at a particular voltage. Why didn't the LED makers specify an operating voltage instead of specifying an operating current? The objective in both cases is to limit the wattage to a level that will not damage the unit. In the case of the light bulb if the voltage increases slightly the resistance remains the same or possibly increases very slightly. If the voltage was originally V1 and we increase the voltage to V2 and the resistance remains the same then the current increases by V2 divided by V1. Or to say it another way the current increases by the same amount. Since the watts equal volts times amps then the watts increase by V squared. With simi conductor devices such as zener diodes and LED's if you increase the voltage beyond a threshold voltage the resistance decreases rapidly. If the resistance decreases rapidly the current increases rapidly. Since the watts equal volts times amps then the watts go out of sight or out of tolerance at least. The LED is specified to operate at 70 ma. In English this means 70 milliamps which equals .070 amps. The specification also says that the typical operating voltage is 2.5 volts. We decided to operate the LED using a 6 volt lantern battery. The character of a good battery is that if we try to draw enough current to drop the battery's voltage below 6 volts it will deliver huge amounts of current. So if we connect the LED to the battery there will probably be only a brief flash of light as the LED is destroyed. So we plan to put a resistor in series with the LED to lose the excess voltage as heat and to restrict our problem of over wattage due to small variations of battery voltage or LED threshold. We will lose 6 minus 2.5 volts = 3.5 volts. Since 70 milliamps of current is to go through the LED the same 70 milliamps will go through the series resistor. 1 volt 1 amp 1 ohm 1 watt Defined by ohms law. 3.5 volts ? amps 1 ohm ? watts If volts increase then amps increase by the same proportion in a resistor. We need more ohms to reduce the 3.5 amps to .070 amps. 3.5 divided by .07 = 50 times more resistance. We have a box full of resistors with colored bands on them. What color bands are we looking for? The bands should be green black black. We have lots of resistors but the two lowest in resistance are brown black brown = 100 ohms and brown red brown = 120 ohms. Lets connect the resistors in parallel and calculate the ohms. The conductance of the 100 ohm resistor is .01 mhos and the conductance of the 120 ohm resistor is .00833 mhos.